IN TODAY'S fast-paced world, where time is as valuable as any expensive commodity, fast food has become a preferred choice for many. Busy souls who neither have the time nor energy to cook a lavish meal after a long day at work are increasingly looking for quick recipes that are easy to prepare and can also satisfy their taste buds. Tapping into this demand, entrepreneurs have now created a business model that allows anyone to cook quick and delicious gourmet meals at home. Cookfresh, an online initiative, was started in February 2014 by Raghav Kohli and his friend Anshul Narang. The company delivers freshly chopped and ground ingredients to homes in South Delhi and Gurgaon in the National Capital Region. Customers can place an order from a variety of recipes available on the website, both vegetarian and non-vegetarian. 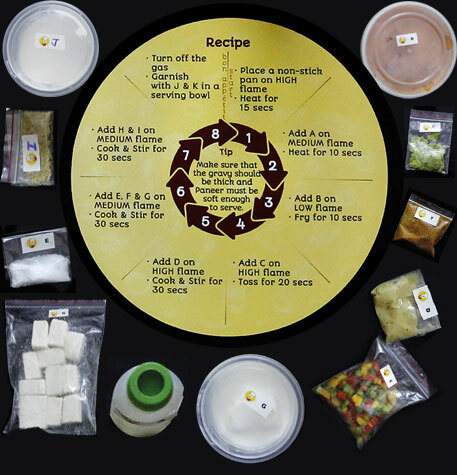 The ingredients for the recipe, in exact quantities, are delivered at the doorstep, along with a recipe card detailing the cooking instructions. All ingredients are chopped just before being dispatched and come with labels inside a biodegradable box, designed to keep them fresh and crisp. “Cookfresh has now eliminated the need to stock up on large quantities of ingredients such as special kinds of sauces and spice mixes that you are not likely to use often,” says 23-year-old Udyan Biswas, a regular customer. Cookfresh claims to be India’s first food delivery service that provides the tools to be a gourmet chef at home. “I was never really an expert cook. So when I surprised my mother with Cookfresh’s chicken vindaloo on her birthday, she was really happy,” says Samaira Sayed, a student. Narang explains that the inspiration for Cookfresh came when he and Kohli passed out of college. “When we were students, we would often throw parties at our house and cook for our friends. But once we started working, we were left with little time. That is how we conceptualised the idea to make easy and quick recipes at home,” he says. His initiative, however, is not easy on the pocket for students. The minimum order at Cookfresh is for Rs 169, which goes up to Rs 749. Most recipes are priced between Rs 300-400. “I have ordered at Cookfresh many times. But as a student I have a tight budget. Since the price is high, I cannot order frequently,” says Sadiya Suhail, who studies law at Delhi university. Cookfresh started with 15 recipes, but the menu is being revamped and currently offers 33 recipes. Besides main-course meals, it also offers desserts and salads. The team aims to eventually introduce a subscription plan wherein a customer will receive three new meals on a weekly basis. Chef’s Basket is another venture based in Mumbai. It was started in 2012 by Nipun Katyal, a food enthusiast, and two of his friends. “We were inspired by Masterchef, but realised that cooking world-class food at home is a tedious affair,” Katyal says. The brand sells its recipe kits online via e-shopping sites like Amazon and at select stores in Mumbai, Pune, Bengaluru, Surat, Kolkata and Ahmedabad. What differentiates Chef’s Basket from Cookfresh is the former’s functionality. Its ingredients are handpicked in their origin countries, including Italy, Spain, Morocco and Mexico, for an authentic culinary experience. These are then imported to the company’s packaging facility at Bhiwandi, Thane, from where they are dispatched to retail stores such as Foodhall, Reliance Mart, Hypercity and Nature’s Basket. Prices vary from Rs 100 to Rs 400. Chef’s Basket sells nearly 50,000 kits every month. “Why buy a bottle of thyme-infused olive oil when all you need is a tablespoon? Besides, it is always a delight for a housewife to receive a package of chopped and ready-to-cook veggies,” says Nighat, a housewife in Delhi’s Kailash Colony. She has not heard about Cookfresh. Shubham Maheshwari, who founded Being Chef in September 2014, did a customer feedback survey in Delhi last year to find out about the common problems people face while cooking. He lists six: which recipe to follow, how to decode complex recipes, where to buy the ingredients from, how much ingredients to use, how to cut and chop the ingredients and customise a recipe as per taste. “People barely use measuring beakers while cooking. Many do not know how much water to add to cook a brick of Maggi. We dispatch ingredients in exact quantities so that people do not have to buy packets of, say, spice mixes when all they need is a sprinkle,” Maheshwari says. Being Chef was launched with an initial investment of Rs 60 lakh. Maheshwari says the monthly operational cost goes up to Rs 6-7 lakh. The company gets about 65 orders on an average during week days and over 100 orders on weekends. It mostly caters to housewives, bachelors and newlyweds in Gurgaon and also takes orders for corporate events and kitty parties. Prices start from as low as Rs 29, with Rs 359 being the maximum. It is, however, too early to say whether this business will make a lasting impact on the food industry or is a passing fad. Devika Narula, who made it to the top 12 in Season 2 of Masterchef India, says it is not everyone’s cup of tea to do a Do- It-Yourself kind of cooking, especially when it comes to gourmet meals. Muhammad Ashraf, manager at Karim at the India Islamic Cultural Centre in Delhi, says it is unlikely that the new venture will cut into the business of the existing food chains. “It is not really about a box of chopped vegetables and ingredients because people do like going out with friends and family on weekends. The concept is innovative but not something that people would want to do every day.” He estimates the profit of these companies to be Rs 150-200 or more depending on the price of the recipe as the owners purchase the ingredients from vendors at a highly subsidised rate.